The plan for my big summer road trip was to end up at the Toroweap Overlook on the north rim of the Grand Canyon. That trip was interrupted, though, before I could make it back down out of Utah. 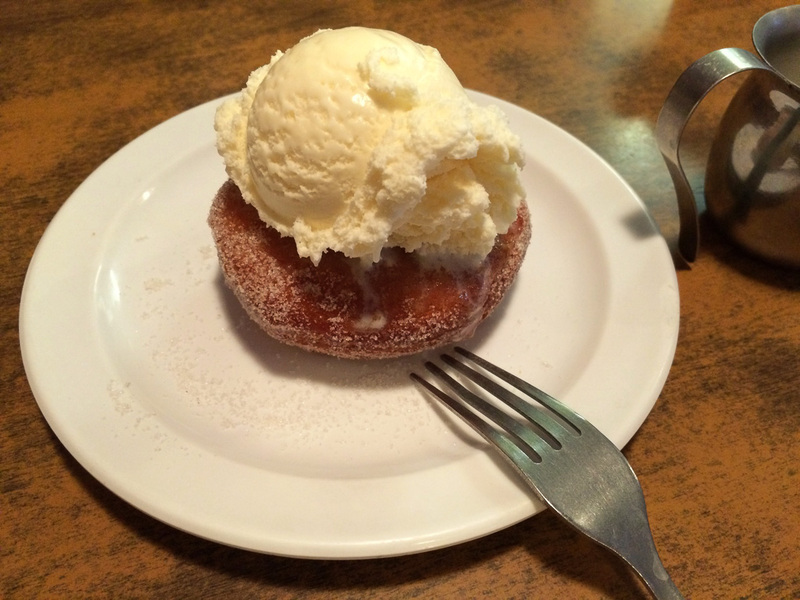 Fresh made-for-us donut at Miz Zip’s in Flagstaff, Arizona. I drove to Flagstaff Thursday night, and we loaded up and took off for the north Friday morning. Didn’t make it past Miz Zip’s, though, before stopping for pancakes, eggs, bacon, and a fresh donut. 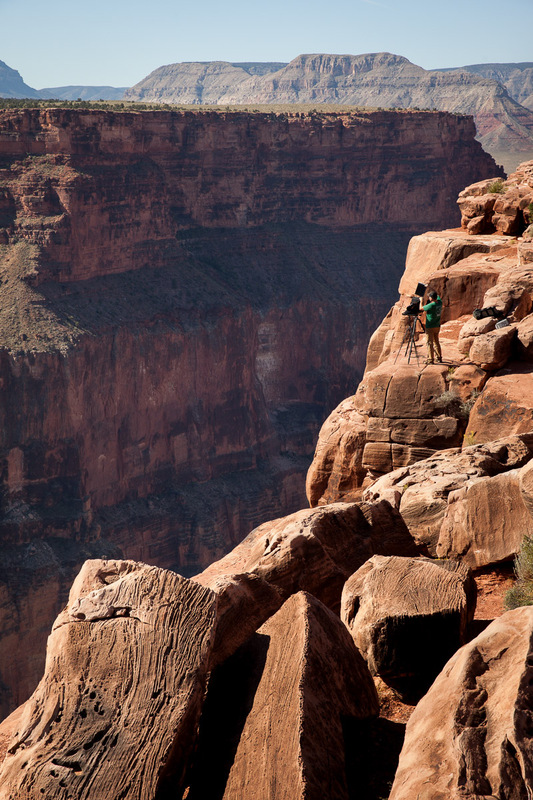 One of the many fascinating things about the Grand Canyon is that the north rim is both so close and yet so far away. As the condor flies, it’s just a few hundred yards to a few miles to the other side, but as the Toyota drives, you gotta go all the way up to Lee’s Ferry, then back down around the Vermillion Cliffs, up to Fredonia, and then all the way down to the Overlook. The downside is that it takes around seven hours from Flagstaff. The upside, of course, is that the scenery along the way is phenomenal. The porch at the Lee’s Ferry Lodge has a pretty stunning view of the Echo Cliffs. Another upside is the porch at the Lee’s Ferry Lodge, where tradition holds that Shane must stop to chat with Charlie and maybe have a beer. Who am I to argue with tradition? From there we climbed up to Jacob Lake and dropped back down into Fredonia, gassed up, and hit the gravel road out to Toroweap. 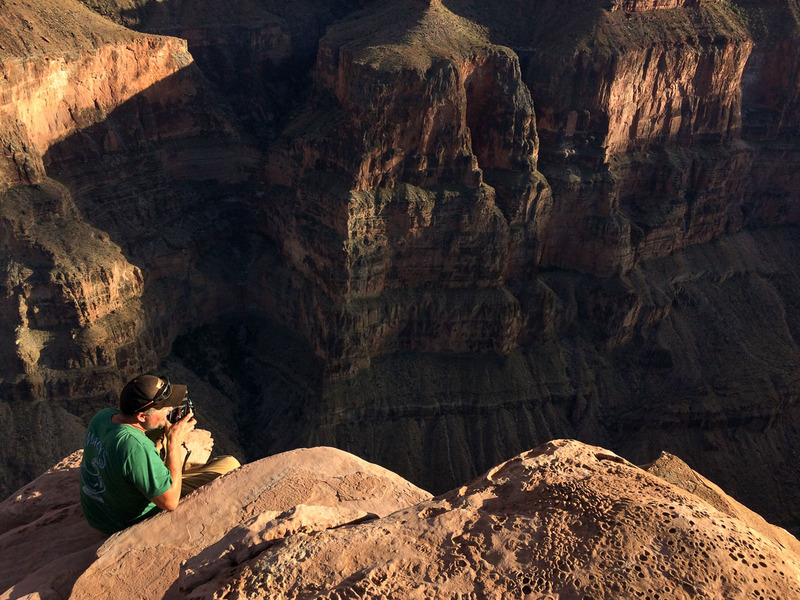 Shane surveys the canyon from an outcrop while I cower a few feet back from the edge. It’s a 3000 foot drop from where we’re standing. Since we got there fairly late in the afternoon I decided not to set up my tintype gear, but rather to use the time to explore the area and scout locations for the morning. 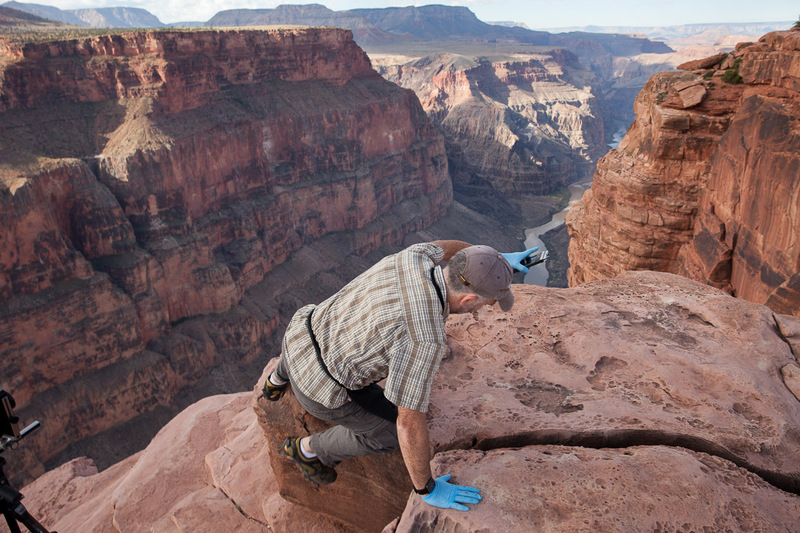 The setting sun casts my shadow on the rock face while Shane climbs up for a better view of the canyon. 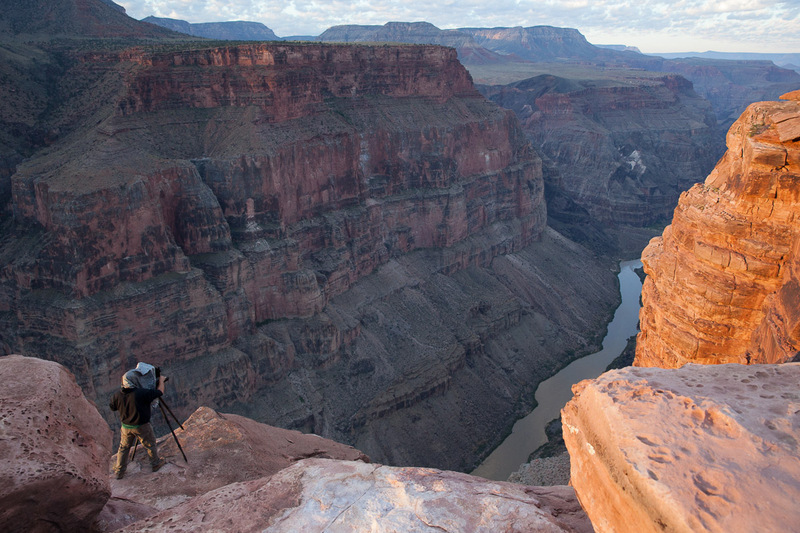 I wanted to get what seems to be the “classic” view from Toroweap – the shear cliff on the north rim and the Colorado River thousands of feet pretty much directly below – but I had a feeling I liked the complexities of the canyon to the west a little bit more. So I started looking to the northeast (upriver) in the morning, before shifting locations in the afternoon. The photo below shows my camera position for that tintype above. It wasn’t at all dangerous to scramble over those rocks, hurrying so that the plate didn’t dry out too much. Nope, perfectly safe! Shane make a photo with his 8×10, looking upriver to the northeast. 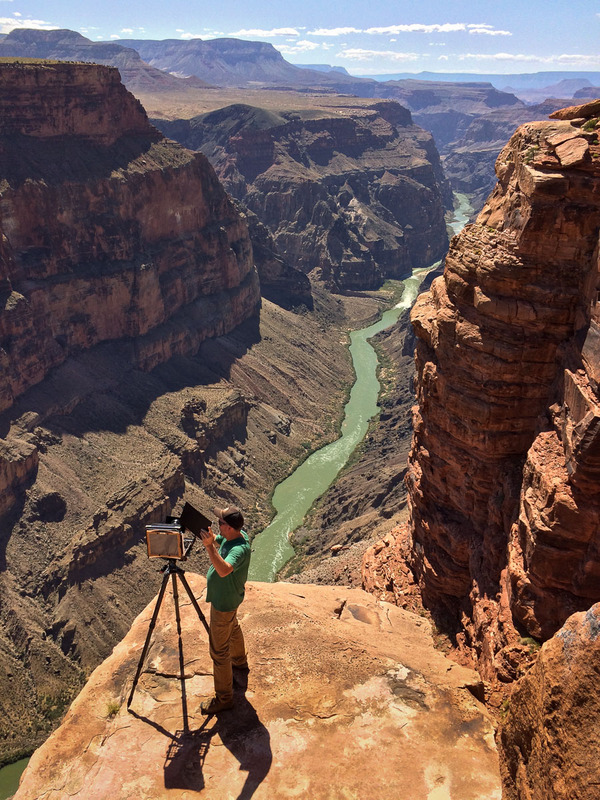 Shane Knight makes an 8×10 film exposure of the Colorado River at the Toroweap Overlook, looking downstream to the west. In addition to his 8×10, Shane also rocks a Rollei for some medium format work. 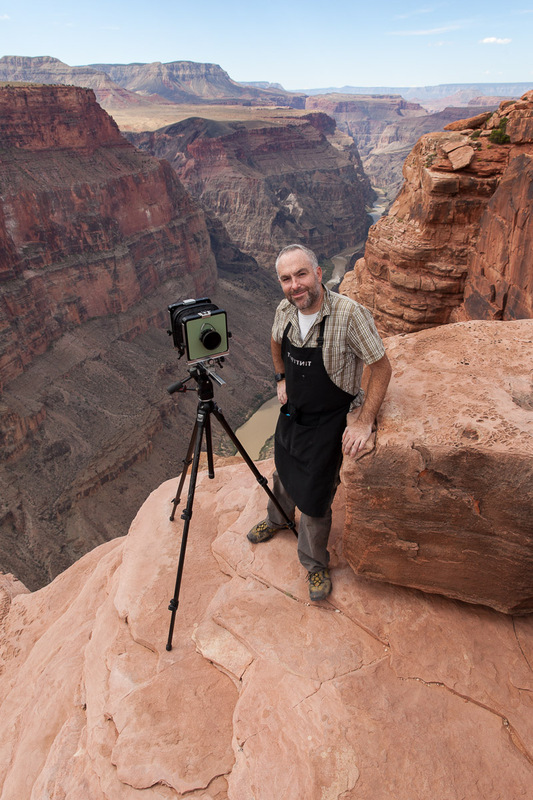 Much of the rocky west has lovely ledges for me to set up my gear on – nearly as good as a darkroom’s tables. From this second location I had planned to photograph both up- and down-stream, but in the end I just worked the view downstream to the west. 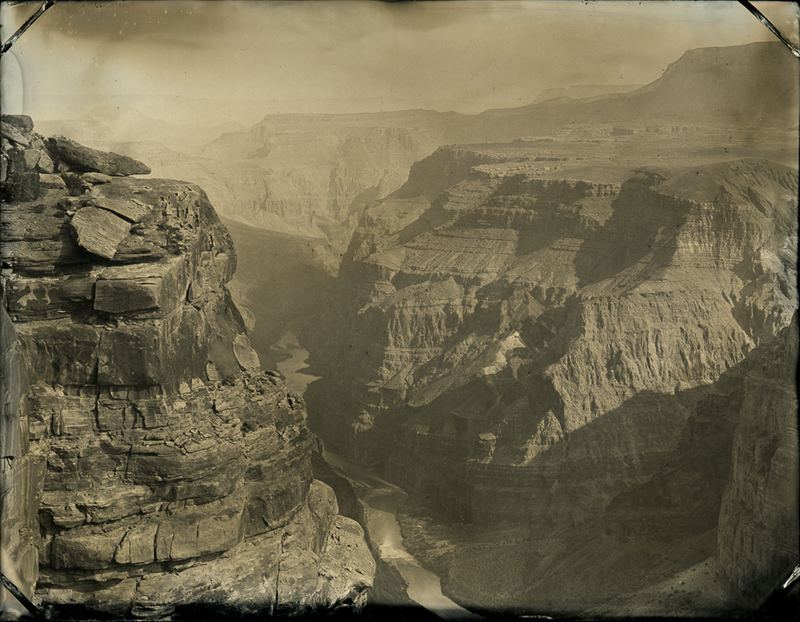 I’m not saying one way or another was better, but I love the way the more-varied canyon walls look in tintype. Upriver is simple and stark and powerful, downriver is layered and complex. And all of it changes as the sun moves during the day. Shane mentioned a few times that the angle of the sun – and the clouds and snow and everything – make a big difference seasonally, too. In short: could probably spend many days here over many years and still never see all the nuanced details. The road out to the overlook is so bumpy that the first morning out, my collodion was full of bubbles and stirred up sediment and all of my plates were messed up. 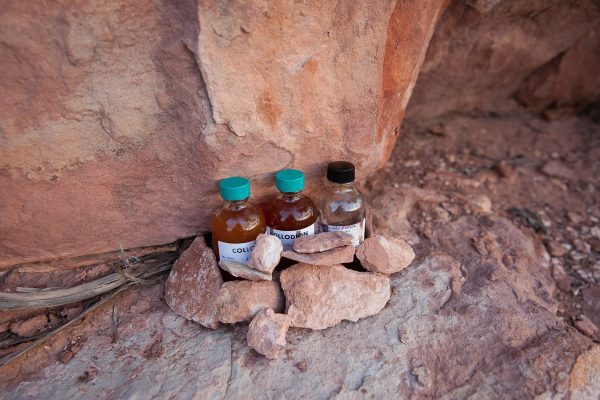 For the second day I stashed a few bottles at the overlook so they didn’t have to bounce all the way to camp and back. It was cool having somebody out there with me, for many reasons. One was that I got some photos of me at work and I didn’t have to be awkward with a tripod and self-timer. 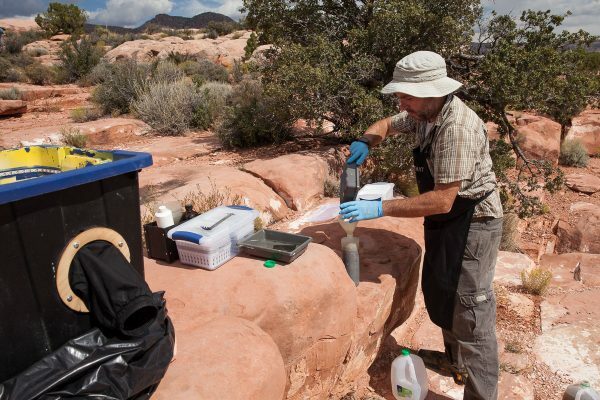 I filter the fixer frequently, since it tends to collect a lot of gunk out in the desert. Thanks to Shane Knight (www.shaneknight.com) for the photo! I made a few tintypes in the afternoon, basically worked until dark, and made a total of 24 plates on Saturday. By the time I finished washing and drying them, at 9:30pm, I was exhausted and Shane was already dozing in his camp chair. When I switched to a longer lens, Shane’s preferred spot was out of my frame, and we could both make our photos at the same time without interfering. I’ll be interested to see how his film turns out! Sunday morning we were up at dawn and back at it. Me with the tintypes at my second location, Shane with his 8×10. At f/16 and with a few other factors, my exposures were in the 20-30 second range, so I use my watch to count. Much more accurate that my “mississippis” or “hippopotamuses”. Thanks to Shane Knight (www.shaneknight.com) for the photo! Thanks to Shane Knight (www.shaneknight.com) for the photo! Around 1pm I finally finished my last tin and started packing up – we (ok, Shane) still had many hours to drive home. We got out to the paved road, put air back in the tires. Shane “airs down” to make the rough roads more comfy and to reduce the chance of tires getting punctured. He has an air compressor built into his truck (how cool is that?!) so we just pumped them all back up and drove back in to the “civilization” of Fredonia to get gas (and internet!) From there the next stop was the Lee’s Ferry Lodge for chicken wings and beers before the final push on to Flagstaff for the night. I agree with Shane, this spot is a pretty great place to begin and end an adventure in the northern Arizona and southern Utah deserts! 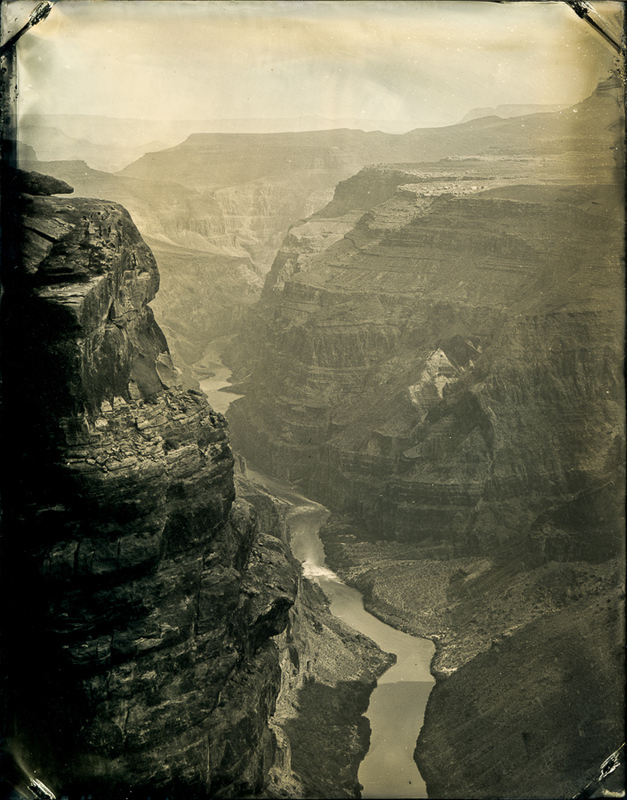 September 18, 2017 | Filed under Historical Processes, Landscapes, Tintypes, Travel.